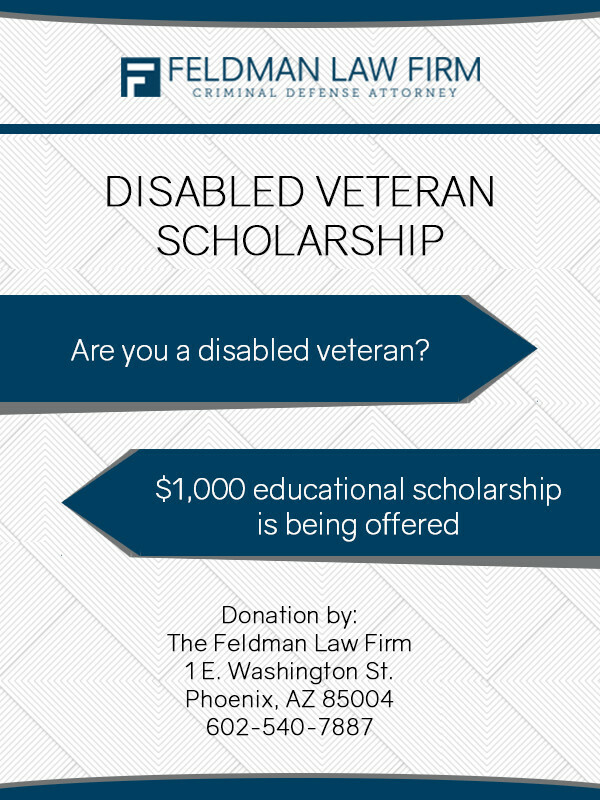 The Feldman Law Firm will be awarding an educational scholarship for the benefit of disabled veterans. The scholarship will be for $1,000, and it will provide tuition assistance for the successful applicant. It is being offered to encourage disabled veterans to continue their education, and provide financial assistance toward that goal. Disabled veterans of the Armed Forces of the United States often face a difficult transition when their military service ends. We believe they must have support waiting for them when they return to their civilian lives. This is particularly true when military service has disrupted their schooling. The scholarship being offered by our firm is intended to assist in that transition. By providing this financial support, we hope to make it easier for a disabled veteran to re-enter the educational sphere, and thereby enhance their career opportunities. The $1,000 disabled veteran scholarship is offered to eligible applicants who wish to attend a trade or vocational school, or a college or junior college. Applicants do not have to be enrolled in a school at the time they submit their application. We do require, however, that the scholarship funds be used within a year after the date on which it is awarded. The winning applicant will provide us with a tuition invoice from the educational institution he or she has chosen, and we will pay $1,000 directly to the school. In order to apply for the scholarship, you must be a veteran of any branch of the Armed Forces of the United States. You must also have a disability rating of 30% or higher. Fill out and complete the online application form. Provide us with (upload) a statement of 125 words or less discussing your educational goals. (Optional) Provide us with (upload) an essay of not more than 850 words discussing how your military service has made an impact on your life. In addition, we may request proof of your veteran status, and proof of your disability. The application, together with any upload(s), must be submitted by February 5, 2018. The winning applicant will be notified on or before March 5, 2018. The winner will be selected by Adam Feldman, founder of The Feldman Law Firm, in his sole discretion. When you provide us with information, that information becomes our property. We do not sell your information to anyone, and except to publicize or report on our scholarship program, we do not disseminate it to any third parties. The Feldman Law Firm, PLLC has merged with The Law Office of Bret A. Royle for form Feldman Royle, Attorneys at Law, PLLC. Adam Feldman will still remain the sole attorney of record for all cases retained under The Feldman Law Firm, PLLC. Is located in Phoenix, Arizona and provides criminal defense throughout the state of Arizona. This website is not intended to create a client attorney relationship, nor does communication though this website. This website is for marketing purposes only. If you have been charged with a crime contact The Feldman Law Firm for a free consultation.